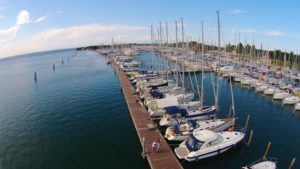 In force since January 18, 2016 (with the possibility for boatyards of marketing products conforming to the earlier 94/25/CE until January 18, 2017), directive 2013/53/UE concerns water scooters, components and engines for yachting and all boats of a length between 2.5 and 24 m which, if they are to be “legal” and so be freely sold in the European Economic Area, must today meet certain “construction and equipment criteria” based on: passenger health and safety, product quality, environmental impact and consumer protection. To shed light on a complex topic that is of fundamental importance for certain professional categories, ENAVE (Ente Navale Europeo), in collaboration with ATENA (Associazione di Tecnica Navale) and with the Order of Engineers of the Province of Milan, organised an interesting seminar entitled “Yacht design and CE marking for pleasure boats”. Designed to offer training credits for the orders of architects and engineers, the meeting, with the patronage of AS.PRO.NA.DI. – Associazione Progettisti Nautica da Diporto, was held at the Milanese headquarters of the Lombardy section of the Lega Navale and attracted several participants. Expectations were not disappointed and the meeting offered a chance to explore in depth a regulation which, because of its “youth” and certain incoherence is an critical areas concerning Italy, is still rather hard to understand. Ably guided by the engineer Giovanni Ceccarelli, president of AS.PRO.NA.DI, speakers tackled key issues in an exhaustive way, including: the procedures manufacturers must follow, with the help of notified bodies, to obtain the CE marking, the certification needed to sell yachts and the procedures for compiling the technical and post-construction file. After a welcome from the president of Atena Lombardia, Bruno Della Loggia, the engineer Giuseppe Macolino (ENAVE) clarified “the role of the notified body”, which evaluates conformity with the EC directive, underlining that the procedure must involve an in-depth control of the quality system and an examination of the technical documents supplied by the producer to support the safety, quality and performance declarations. While the satisfaction of the requisites of conformity is certified by the CE marking (applied by the manufacturer who, in this way and unlike previous practice, assumes full and exclusive responsibility for the conformity of the product to community regulations), the evaluation of the conformity of the requisites is the job of certain legitimated technical bodies (the so-called “notified organisms”, authorised by Italy and notified to the other EU states), including RINA, the Agenzia Nazionale per la Sicurezza and ENAVE, which act with authorisation from the Ministry of Economic Development with the Ministry of Infrastructures and transport. Among the many sessions during the afternoon, one worthy of mention was “An example of design among the regulations”, in which Giovanni Ceccarelli (of Ceccarelli Yacht Design) clearly illustrated what had changed in the designer’s role after the coming into force of Directive 2013/53/UE. While before designers had to send to RINA the documentation on every boat they designed in three copies (one for the yard, one for the files and one for the designer), today the designer, who appears as a “mere consultant of the boatyard”, may simply send the yard the design drawings of the vessel, a basic layout (a kind of “master section” of the boat), and according to the regulation he need not even put his name on it. To avoid this (which Ceccarelli considers a lacuna in the directive) becoming counter-productive, he underlined several times the importance of delivering to the yard he worked for documentation that was “as complete and exhaustive as possible” and included, in particular, not just indications on the rough organisation of hull and deck but also data on the vessel: measurements, draught, empty and fully laden displacement. In this way, if the yard decided to overturn the project to satisfy, for example, requests for customisation and the boat no longer complied with the regulations, the designer would have no responsibility in any legal proceedings. Also centred on the figure of the designer (in his day-to-day activity) was the talk by Davide Tagliapietra (an engineer with STYacht), on “structural calculation between the regulations”. After presenting his design of an “extreme” racing boat, designed to optimise safety and performance, Tagliapietra underlined that, today, good design work was that which produced a vessel that could guarantee its owner the absolute certainty of “having fun in safety”, even when it was a pleasure vessel. To achieve this it was fundamental to have, in every phase of the project, a constant overall view of the vessel, that necessarily involved knowing the current regulations on product quality and safety, also to ensure coherence with the concept of “Guaranteed level of protection” or “Safeguarding clause”, which meant that users, when they saw the CE marking, should feel safe. However, the coming into force of the community regulation did not involve only designers. Before the arrival of the requirement to apply a CE marking to vessels, for pleasure boats in commercial vessels the quality reference was the Code of Navigation and RINA regulations, and the role of the yard was marginal (it was just a manufacturer/seller), but the new provision is different: under the new European regulation the manufacturer is the only responsible party. In a sector where there is still remarkable uncertainty, as an Italian Supreme Court admitted when asked who should be considered responsible for damage to 3rd parties, defining the current regulation “too young to be able to give a precise answer”, the Technical file is fundamental, especially as concerns modifications to the boat on request from the owner. “When there is increasingly extreme customisation,” said F. Prinzivalli, “it is important for yards to have available the technical files of all the models produced, including every single modification carried out.” In fact it should not be forgotten that, despite the presumption of conformity which means that a boat with the CE marking is presumed to conform to the regulation, when it is in foreign waters it may still be subjected to inspections. As highlighted by Alessandro Suardi (an ENAVE ship engineer) in his talk “The post construction procedure”, it is worthy of note that pleasure vessels are the only “products” with a CE marking that can undergo modifications even after being placed on the market, but the product must be safe and conform to the CE regulation even after the modification (a typical example he quoted was the need to substitute the engine of the boat). The interest shown by the public in the many issues tackled during the convention, including “Marking of rigid inflatables and the technical file”, by Maurizio and Alessio Casati (Yachting Design), “An innovative way of bringing a sailing boat to market”, by Paolo Portinari (Rossoragno and H3o Yacht Design), and “The safety certificate renewal visit”, by Valeria Ribaldi (ENAVE engineer), was shown by the heated debate at the end of the day, after the final intervention by Giuseppe Macolino “The answers to the most common questions on safe navigation and respecting the law”.